Long repressed, banned, and exiled, many Islamist movements and parties across the Middle East and North Africa witnessed a moment of electoral success after the 2011 uprisings. Since then, their fates have varied widely. Some have made significant compromises to stay in power, others have ostensibly separated their religious and political efforts, while others have been repressed more brutally than before or have fragmented beyond recognition. What accounts for these actors’ different adaptation strategies and divergent outcomes? Earlier this year, the Project on Middle East Political Science brought together a dozen top scholars for our 4th Annual workshop on Islamist politics to address these questions. Their excellent essays are available individually on the POMEPS website and collectively as POMEPS Studies 26, available now as a free PDF. Many scholars are pushing to move beyond the traditional framing of Islamist movements. Khalil al-Anani challenges the approach that treats Islamist groups as collective entities, and discusses how personal experience of repression can influence individual members in contradicting ways. Likewise, Jillian Schwedler describes how the debate around inclusion (and whether it makes actors more moderate) is now moot as leaders increasingly move toward repression and away from inclusion. Elizabeth R. Nugent, meanwhile, challenges scholars’ tendency to focus on the uniqueness of Islamist groups and encourages future research to compare similar organization operating in moments of political opportunity to help normalize the study of Islamist politics. Eva Wegner uses innovative survey data analysis to rethink the common assumption that voters for Islamist parties are simply registering a protest vote, finding that ideology does, in fact, matter to many voters. Lindsay J. Benstead looks at the effect of the “Islamic mandate effect” on women’s representation, where the level of freedom or regime control influences a party’s ability to deliver on its promises of symbolic and service representation. In Islamic State controlled areas, Mara Revkin and Ariel I. Ahram look at the tenuous social contract in civil war contexts and how civilians – though they may not actually support that paradigm – sometimes use its institutions to speak up and voice criticism. Several authors reveal the careful balancing act that Islamists must maintain to stay in power. Steven Brooke delves into the complicated relationship between Islamist movements’ socio-religious activism and political engagement and attempts – some more successful than others – to separate the two. Quinn Mecham presents the unique case of Morocco’s PJD party, which acts simultaneously a voice of opposition and of the government. Monica Marks examines the Tunisia’s Ennahda highly contested compromise and contention. Nathan J. Brown describes the state’s messy involvement with Islam and its, often inelegant, attempts to craft and control religious messages through its bureaucracy. Annelle Sheline, looks at how regimes have wielded the rhetoric of “moderate Islam” to justify repression of Islamist opponents and seek out aid and support from Western governments. In a study of the Islah party in Yemen, Stacey Philbrick Yadav highlights the internal fracturing of the diverse party and questions western governments’ continued reliance on it. Marc Lynch recognizes the difference between U.S. policy makers who readily “lump” all Islamists into one category and those who more carefully distinguish and operationalize differences among groups. Is the latter necessarily less dangerous? 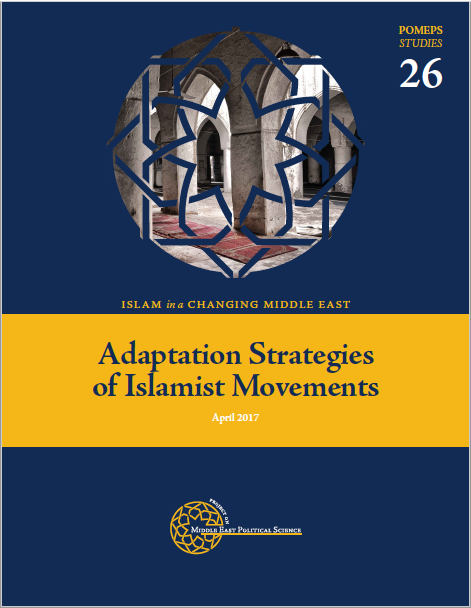 Sharing insightful new research and posing key questions for future scholarship, POMEPS Studies 26 provides an excellent primer into the diverse adaptation strategies of Islamist actors in the Middle East and North Africa. Download it today.